At Split Simple, we talk a lot about “uncontested divorce” and our transparent, data-driven process for handling it. But it’s possible that the phrase “uncontested divorce” might be a little misleading to people who are unfamiliar with the legal system. “Uncontested divorce” does not mean simple, easy or conflict-free. Instead, it describes the result – an agreement both parties agree to and then jointly submit to the court. We recognize that there is almost never such a thing as an easy or conflict-free divorce. Even good-natured couples who agree on most things will likely have a handful of disagreements over the disposal of various pieces of property. Most of our uncontested divorces begin with significant disagreement. In a traditional divorce, these disagreements are resolved by a judge, and not always to anyone’s satisfaction. At Split Simple, you control the path to final agreement by working through these disagreements and finding solutions with the help of our experienced attorney-mediators. You decide your future – not lawyers and judges. We estimate 90% to 95% of divorces are ultimately filed as uncontested. 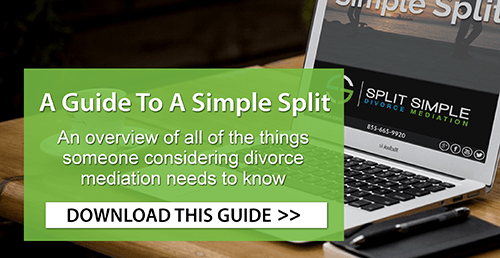 If you need an experienced attorney-mediator to help you work through a divorce with your spouse, please call Split Simple today at (855) 665-9920 for a free consultation. There’s a scenario that’s incredibly common at our offices – we get a call from two people who have decided to get a divorce. They were intent on keeping things amicable and simple, but they’re despairing of that now. They’ve run into intractable problems that are seemingly unsolvable. This often happens because issues that are actually financial become emotional in nature. Who gets the car that was the first major purchase you made as a couple? What about a piece of furniture one spouse made but that both now love equally? And the issue of spousal support is undeniably sensitive – put bluntly, spouses often don’t much like each other at the time of a divorce, and while those feelings fade in time, the thought of paying this person some of your hard-earned money is galling. And, of course, finding the proper custody arrangement for the children is a difficult, hot button issue. In these situations, many couples elect to go with a traditional courtroom divorce, believing that they can’t work out the problems themselves. We don’t believe that. At Split Simple, we believe that mediation can resolve any problems that arise in a divorce. There is no knot that can’t be untied. There are no problems we can’t help you solve. Our attorney-mediators work with both of you to find answers to these problems – we do so objectively and impartially, using a transparent, data-driven process that involves clear calculation of the financial issues involved. We work to make sure issues are discussed on their own terms, not in relation to past grievances. This process isn’t always easy, and with money involved, it’s rarely simple, but it gets results. It might be tough. But our attorney-mediators will find the right path to the kind of fair and equitable settlement both you and your spouse can agree to and submit to a judge. And that’s what an “uncontested divorce” really means. If you’re looking for an attorney-mediator who can help you and your spouse work through complicated issues, please call Split Simple today at (855) 665-9920 or contact us online for a free consultation for Chicago divorce mediation and Denver uncontested divorce services.